A couple of weeks ago I received a series of photos attached to an email from Todd Bird. When he purchased a house in Tawas, MI, this rock was left behind as a door stop. It is approximately 7.5” by 4” and weighs 5 pounds. Most of the specimen is translucent. 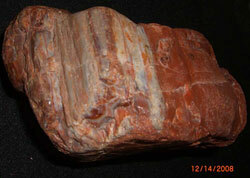 There is banding throughout, with the most striking being the candy-stripped bands at the end of the specimen. I have examined it by zooming in with Photoshop. The bands definitely look self-organized, although the appearance is much different than that of other agates found in the upper Midwest. 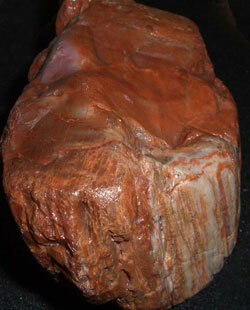 It most likely is some type of bizarre tube agate, probably formed within a sedimentary rock seam. The banding pattern reminds me of the sedimentary agate from Thunder Bay, Ontario, but the color and appearance is much different. If any of you have seen something similar, or if you have any other ideas about the rock’s genesis, please send me an email to karen @ agatelady.com.